Helping companies use pricing to grow their profits. Quickly see what users have access to your version of BlackCurve, the date they were added to the system, and what their user type is. Set the percentage discount that users can give before further approval is needed. Set the maximum quotation value that users can issue to customers before further approval is needed. If a user wishes to discount beyond their allowed limit, they must seek authorisation from a different user who has the appropriate percentage change allowed in their profile. As your business evolves your employees may change. With a few clicks, you can revoke user access. Upon first using the system, or when other employees need access to the system, use the invite a user workflow to configure a new profile. For a touch of personalisation, you can even send new users a welcome message. We know that job titles and job roles differ from organisation to organisation. Therefore we give you complete control to setup your own user types and manage read/write and functionality access for every user level. If you have sent an invitation by mistake, it’s simple to cancel an invite. Alternatively if a user has missed the automated email to setup their profile, you can resend the invite. Information security is important, and if your data gets into the wrong hands it’s sensible to have a suitable legal statement in place. With BlackCurve, you can add your own disclaimers that will appear at the bottom of all outbound emails. Set up different pricing regions. A region can refer to but not be limited to, a specific geographic location, country, group of countries, website or customer type. Assign a default currency to every geography. This will ensure the exchange rate is factored in to all pricing calculations for the assigned geography. Assign the base currency that you use for managing your main price list, and then add other currencies and exchange rates that you wish to be available in the system. If you wish other geographical prices to be set up quickly off the back of just managing a single geography, apply the currency conversion (if applicable) and use the relationship tool. If you wish other geographical prices to be set up quickly off the back of just managing a single geography, as a % higher or lower, apply the currency conversion (if applicable) and use the relationship tool. Set whether prices should be displayed with or without VAT, and manage VAT levels across different countries and geographic locations. Shipping and Delivery Costs can cause havoc with your profitability. Set up a default carriage amount to ensure that all quotations include a base charge. Manage a database of pricing change rationales that can be used for reporting purposes. Set up a default disclaimer, company address, and layout for your PDF price lists which you can issue to customers. Set up your default payment terms, quote validity, cover letter wording, terms and conditions, company address and layout for your quotations which you can issue to customers. Plus, manage a database of won or lost quote rationales, which can be used later when you change a quotation status. Manage the core colour and upload a logo that will be used on your price lists and quotations. Setup minimum margin checks and psychology pricing rounding rules. These can be used when setting up your benchmark prices or pricing exceptions. Manage notification preferences around any changes in data that have been added to your Data Management, such as a new product added to Product Inventory or a change in competitor price for a matched product. Nobody likes to be left out in the dark. If you’ve forgotten your password, it can be retrieved automatically, and you’ll have access to Blackcurve again in no time. Each customer receives their own dedicated secure web address e.g. customer.blackcurve.io. You can either go directly to your chosen web address each time you want to use the system, or access it through our website. Want to change your own password? No worries, we’ve got you covered. It’s easy for email inboxes to get clogged up. That’s why you can decide whether to be emailed upon each action, receive a daily digest, or only see notifications when you’ve logged in. Have complete control of all the goods and services you're selling in an easy to use database. A bulk upload function is compatible with all major spreadsheet tools for mass updates. If you use a high low pricing strategy, you may sell bundles of goods which are very similar to each other. Use the product matching tool to link these items to ensure your reporting is not skewed. A single database to manage all your customer details, such as their ID, Name and Address, so that you can create quotes seamlessly by selecting from an existing customer list. A bulk upload function is also available for mass updates. A single database for recording your sales history. This can then be used for modelling your price changes within Benchmark Pricing and Exceptions. Upload your own competitor pricing data (like-for-like or branded matches) or use data provided by our partner network. This data is then available for use in the dynamic pricing engine. Upload website performance data, such as the number of product searches, or the basket conversion statistics. All these data points support the overall pricing strategy and help to identify opportunities to tweak price. Upload and manage your own additional data sets that you would like to use to drive your pricing decisions. Setup your retail recommended prices or starting price for all your goods and services within each geography, and take advantage of margin checks and rounding rules. 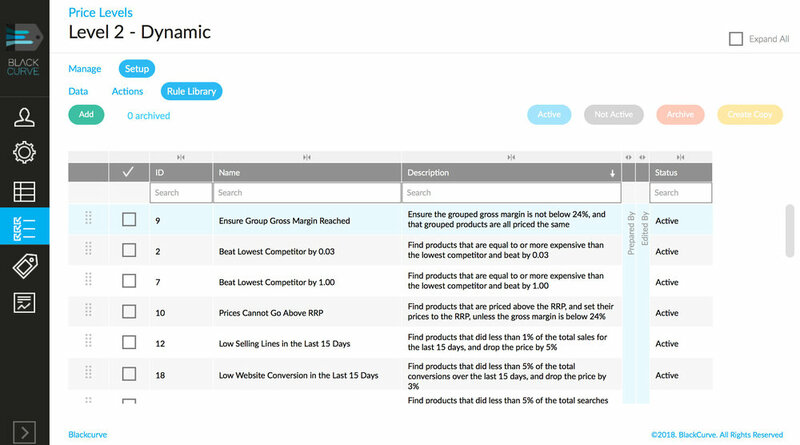 Get the full power of an off-the-shelf rules library, so that with a few clicks you can price dynamically dependent on cost price fluctuations, competitor pricing, website performance, sales performance, planned sales, and stock levels, to name a few. Manage pricing exceptions for specific products or geographies. These include a specific alternative fixed price, configure a price for a bundle of goods purchased together, or ensure pricing consistency by using attribute based pricing to set the final sale price. 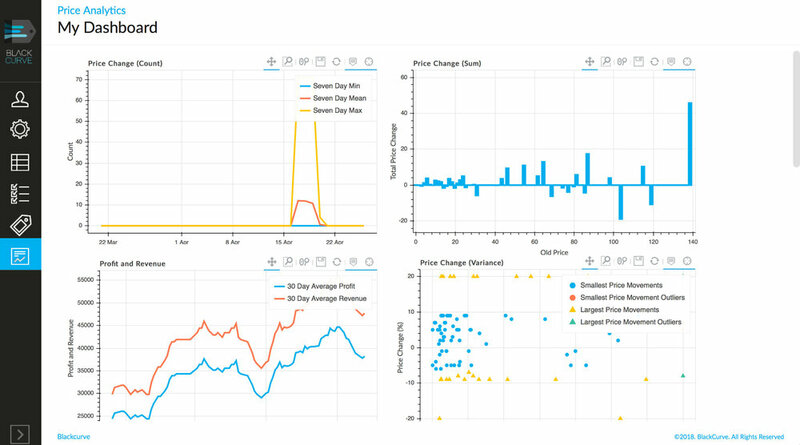 In utilising your sales history data, model the impact of any pricing changes you make based on differing degrees of price elasticity. Provide sales staff with the ability to quickly find prices based on parameters such as region, customer segment, or currency, and then apply additional considerations such as their allowed discount level. Setup specific customer price lists that can be downloaded or emailed to sales staff and customers in pre-formatted templates directly from the system. A streamlined process for managing your quotations. The quote module starts with a dashboard to give you access to all the quotes you have created to date, as well as start a new quotation. A search feature is provided to enable you to filter by Quote Number, Customer ID, Customer Name, Quote Name, Owner, Revision, Approval Status and even by Validity Date. In the dashboard you can also change the quotation owner. This is especially useful if a member of sales staff has gone on holiday and another employee needs to take over the sale at short notice. Here you can give your quote a name and assign it to a customer. If the customer does not yet exist in the system, an additional workflow is available to set them up on the system. An easy to use workflow is provided to change the status of your quotation to Open, Won, or Lost. Where the status is changed, you will be asked to provide a rationale which can be pre-set by a system administrator. This ensures there is a reporting feedback loop, which may be particularly useful when you have lost a quote, e.g. if you're regularly losing based on price, this may indicate that a pricing review is required. Sometimes you make a mistake, or sometimes a quote is no longer needed due to its age. At Innoware we don't believe in deleting quotes, as once it's gone, it's gone! The archiving functionality allows you to move quotes to a separate part of the system, that can be restored at a later date if required. Quickly add or remove items from your product inventory to your quotation, and the unit price and total price are dynamically calculated based on the quantity entered. Dependent on your authorisation level, you are also given the option to apply discounts. If you need to add items that do not exist in your product inventory, such as specialist labour, an 'Other' section is provided to do just this, where you can assign a type description, quantity and unit price. Your quotation may need to add carriage (also known as a delivery charge). Quote Manager enables you to enter in either a fixed price fee or apply a percentage uplift to the final quote value to cover carriage. We know that the ordering of items in your quotations is important. That is why you can sort the order of any column alphabetically. If you wish to apply a different ordering method, drag and drop functionality is available. An administrator can set the standard payment terms, validity period and design that will be applied to each quotation. However, there may be instances where your sales team need the flexibility to alter this for an individual quote. The options page allows you to change these items, as well as select whether you would like a cover letter (and to edit the text displayed), cover page, customer logo, table of contents, back-page, and even if you wish to show the prices line by line, just as a total price, and with or without VAT. Reduce price erosion caused by rogue discounting with the in-built approval process. If sales staff wish to discount beyond their approved level they must seek authorisation which is fully auditable at a later date. Preview how your quotation looks to check the layout and contents before emailing it to your chosen customer. Select pricing rules to apply to this quotation or specific part. Versioning is automatically handled, so that once a quote has been approved or issued, if further changes are made a new version is stored. This gives full traceability, and if you wish to return to a previous version a full restore option is available. The History element keeps a username, date and timestamp of all changes, again to support traceability. Developed by a BlackCurve Team that are experts in the fields of pricing, quantitative financial analysis, science and maths (at Doctorate, Masters and Bachelor levels), the dashboard will help you answer critical pricing questions. These include: How is my pricing strategy performing? What are my competitors’ pricing strategies? What opportunity do I have to improve pricing?